TLM-700K Shown in Use. Camera Not Included. 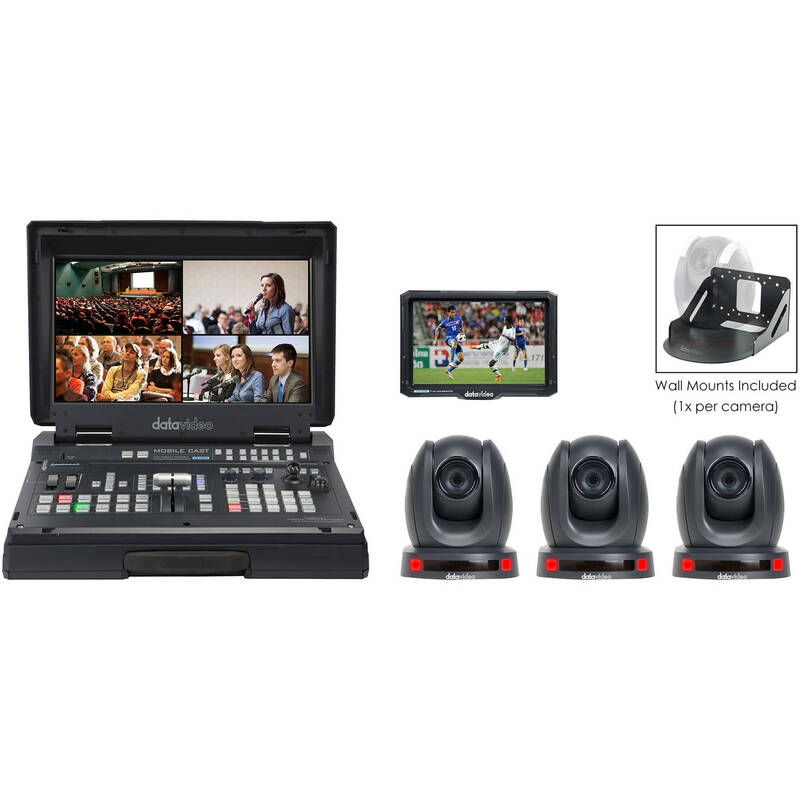 This Datavideo HS-1600T Mobile Studio Kit with 3 x PTC-140T, Wall Mounts, and TLM-700K provides you with a mobile switcher that supports three HDBaseT inputs and a single HDMI input, as well as three PTZ cameras, three wall mounts, and a 7" monitor. The HS-1600T switcher features a built-in 17" monitor, T-bar, joystick, and control panel buttons, and it supports tally function. It is the heart of the kit that enables you to set up a mini studio virtually anywhere you have power. The three PTZ cameras can each be individually controlled via Ethernet, IR, or RS-232 protocols. When streaming over the built-in Ethernet connector, you can easily connect to RTSP as well as RTMP compatible systems. Each camera in this versatile system supports 255 preset positions, enabling you to quickly adjust the camera's position within a 340° pan and 120° tilt range. The three wall mounts enable you to mount the cameras onto most walls for a semi-permanent installation. The included 7" monitor can be used to see your program output as you use the switcher's integrated 17" monitor for multiview. This datavideo HDBaseT PTZ Camera with 20x Optical Zoom can be controlled and powered over a single Cat 6 Ethernet cable up to 300' away from the network port, minimizing your cabling and expanding your mounting positions. The camera supports frame rates and resolutions as high as 1080p60 as well as 1080i60 and 720p60, and it features a 1/2.8" CMOS sensor with 2.07 MP resolution. The built-in zoom lens features an optical zoom range of 20x, and you can zoom in further with the 10x digital zoom. With 255 programmable preset positions, you can set the camera to rapidly move to between positions using the IP, RS-232, or IR control. The camera compresses using either or both the H.264 and H.265, as its on-board encoder is capable of encoding two streams at the same time. You can stream live using RTSP or RTMP protocols. The camera supports external audio via a 3.5mm stereo port, and you can mount the camera via the 1/4"-20 threaded mounting hole.